This tutorial will show you how to remove an entire class schedule. 1. Through the class calendar. 2. Through the class itself. Click on classes in toolbar. 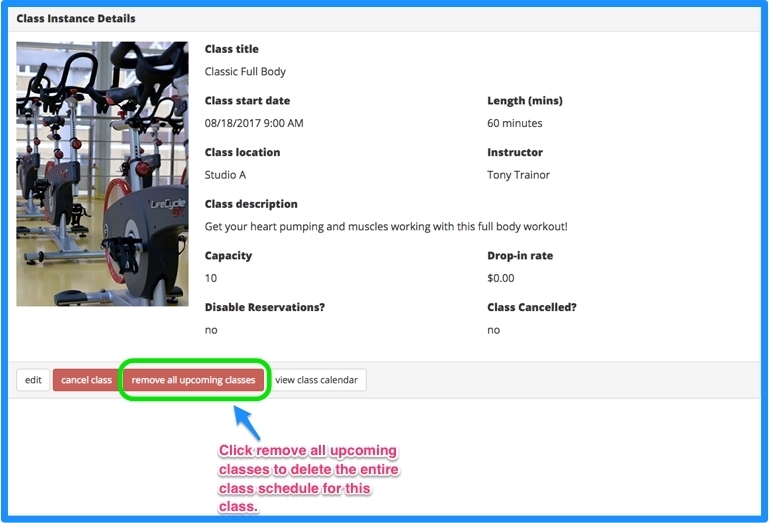 A calendar showing your available classes will appear. Click on the view scheduled classes button to see a list of class schedules. This will show you a list of all your class schedules. Click on the red “x” next to the class schedule that you want to delete. If you have any reservations on that class schedule, a message will appear giving you 3 options for deleting that class schedule. You can Do Nothing, which will cancel the process and take you back to the previous page. You can Remove Only Non-Reserved classes. This will delete only the classes that do not have reservations on that class schedule. You can Remove All Classes. This will remove all classes in this class schedule and any members with a reservation for the class will receive an email notifying them that the class has been canceled. You will also notice there is a list of members who have a reservation located at the bottom of the screen. You have the option to print that list out should you need to call those members personally to notify them of the cancelation. Once the class schedule has been deleted, it will be completely removed from the class calendar and cannot be undone. If you have deleted the class schedule by mistake, you will have to recreate it. Click on the class that you want to cancel. Class Instance Details will be shown for that class. Click on "remove all upcoming classes" to delete the entire class schedule for this class. This will remove all upcoming classes for that particular class and cannot be undone.